We went up to Estes Park, Colorado to hike in the mountains and have a day of fun outside. We started at Basecamp (Uncle Howard's home) and then made our way up into the Rocky Mountain National Forest. It was fun climbing the rocks, stepping over all of the wild flowers and elk poop, seeing real elk and at the end finding an elk carcass. 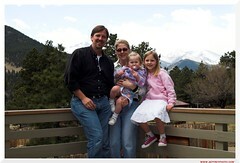 See a lot of photos on my flickr site with the tag EstesPark.